By 1900 Navajo and Pueblo silversmiths were making all of the jewelry forms now considered Southwestern classics. Because silver was not an indigenous craft, however, the origin of these forms reveals a remarkable mixing of cultures filtered through Native vision and inventiveness. 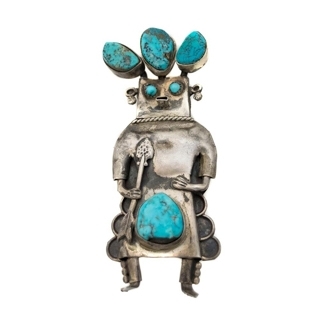 Angela Celicion - Zuni Multi-stone Rainbow God Pin/Pendant c. 1970-80, 2.5" x 1.75"
Attributed to Horace Iule (1901-1978) - Zuni Knifewing Pin, c. 1930-40 2.75" x 1.5"
Attributed to Lee Edaakie - Zuni Turquoise Inlay and Silver Knifewing Pin, c. 1950s, 1.75"
Carmelita Simplicio - Zuni Coral and Sterling Silver Pin/Pendant c. 1960s, 1.625" x 1.75"
Carmelita Simplicio - Zuni Turquoise and Sterling Silver Pin/Pendant, c. 1960s, 1.75" x 1.5"
Frank Vacit (1915-1999) - Zuni Jet Channel Inlay and Silver Pin, c. 1960s, 2.25" x 1.25"
Hopi Silver Overlay Bird Pin, c. 1960, 2" x 1.25"
Hopi Silver Overlay Pin with Kokopelli Figure c. 1960s, 1.375" x 0.75"
Hopi Silver Overlay Pin/Pendant, circa 1960s, 0.875" x 1.125"
Horace Iule - Zuni Silver Knifewing Pin, c. 1940s, 1.75"
Navajo Concho Pin c. 1940s, 2" x 2.5"
Navajo Multi-Stone Inlay and Silver Roadrunner Pin, c. 1960s, 0.75" x 3"
Navajo Sandcast Silver and Turquoise Naja Pin, c. 1950, 3" x 2"
Navajo Sandcast Silver Rainbow God Pin with Turquoise and Coral c. 1960, 1.25" x 2"
Navajo Silver and Turquoise Butterfly Pin c. 1940, 1.25" x 1.25"
Navajo Silver and Turquoise Pin, c. 1920s, 1" x 2"
Navajo Silver and Turquoise Pin, circa 1930s, 0.75" x 2"
Navajo Silver and Turquoise Swan Pin, c. 1950, 2" x 1.25"
Navajo Silver Butterfly Pin - United Indian Traders Association, c. 1940s, 2.25" x 2.25"
Navajo Silver Sandcast and Tooled Pin, c. 1940, 1" x 2.25"
Navajo Silver Sandcast Pin c. 1950, 2" x 2"
Navajo Silver Yei Pin with Bow and Arrow, c. 1960s, 2.75"
Navajo Stamped Sterling Silver Feather Design Pin, c. 1970s, 1.25" x 1.5"
Navajo Turquoise and Silver Butterfly Pin c. 1930-40s, 1.75" x 3"
Navajo Turquoise and Silver Butterfly Pin c. 1960-70, 1.375" x 1.125"
Navajo Turquoise and Silver Deer Pin c. 1960, 1.75" x 1"
Navajo Turquoise and Silver Pin c. 1940, 0.5" x 1.5"
Navajo Turquoise and Silver Pin c. 1940, 2.5" x 1.5"
Navajo Turquoise and Silver Pin, c. 1920, 2" x 2.5"
Navajo Turquoise and Silver Pin, c. 1930s, 1.25" x 1.75"